What started out years ago as a relaxing one-night-a-week diversion has gradually commandeered almost all my free time. I started taking pottery classes at the Clayworks studio at Roberson Museum and Science Center in Binghamton, NY. After several years at Clayworks, I now work out of my own basement studio. I’ve sought more advanced instruction such as an intensive workshop in saggar and raku technique by Charlie and Linda Riggs and a raku class taught by Ramon Camarillo. While working almost exclusively with wheel-thrown forms, I’ve been exploring various carving and deformation techniques. In particular, lately I’ve been exploring “church key” patterns, inspired by the wonderful work of Ken Standhardt. My early pieces were utilitarian glazed items but my work is evolving into more decorative and artistic forms as I explore the possibilities of carving, Raku, and glazes. After retiring from my career in software engineering in 2018, I can now more fully indulge my passion for the challenges and rewards of pottery. 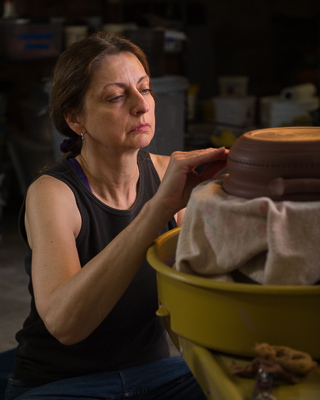 Most people have no way of knowing how much work goes into making hand-crafted pottery. Have a look at this brief video for a light-hearted glimpse of some of the many steps a potter invests in creating something as simple as a coffee mug. Update: After mostly focusing on my retirement transition for the last year or so, I’m doing a careful and deliberate return to pottery making. I’ve re-opened my Etsy shop with a few items for sale and will be adding more as they become available. I have more pottery pictures on my Flickr site at http://www.flickr.com/photos/natureofclay/. Sorry, I don’t do custom orders, at least not for now.